The City of Ottawa has received a Zoning By-law Amendment to adjust the boundary between the O1 and R3Z zone for a small portion of the lands in Phase 3 of the Poole Creek Village subdivision to reflect updated floodplain mapping for the Poole Creek Corridor. The subject site is located in the southerly portion of the Poole Creek Village subdivision, adjacent to the west side of the Poole Creek corridor. The lands to the north and the west of the subject site are zoned for future residential development while lands to the east will remain within the Poole Creek corridor. The Poole Creek Village development located at 5831 Hazeldean Road received draft approval in 2012 (see plan of subdivision for full plan). At the time of the original zoning by-law amendment for the subdivision, the subject lands were within the floodplain overlay for Poole Creek and were zoned Parks and Open Space (O1). As a result of the Mississippi Valley Conservation Authority and the City updating floodplain maps in 2016, the floodplain overlay was removed from the subject lands. The applicant has submitted a Zoning By-law Amendment application proposing to re-zone the lands from O1 to Residential Third Density Zone Subzone Z. Re-zoning the area would allow the realignment of Vivera Place and reconfiguration of the lots adjacent to the creek corridor. Three residential lots would be within the area formerly zoned O1, and a total of 6 additional units are being provided in the subdivision. Technical studies have been submitted in support of the amendment. 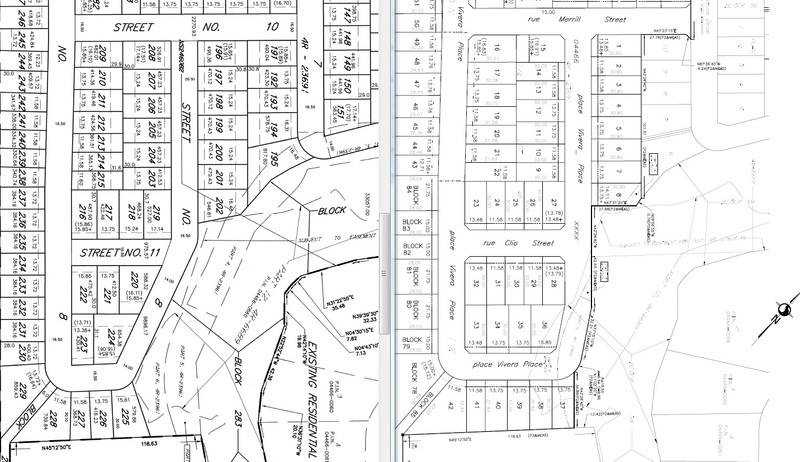 The following image shows the difference from the approved plan (left) and the proposed changes (right). For questions or to provide comments by June 21, 2017 please contact myself and City Planner Kathy Rygus Kathy.rygus@ottawa.ca or 613-580-2424 x 28318.